Examine the tires for air leaks, abrasions, unusual worn areas, cuts, and flat spots. 1) Cuts or weather cracks in the grooves, the tread, or the sidewalls which go to the cord body. 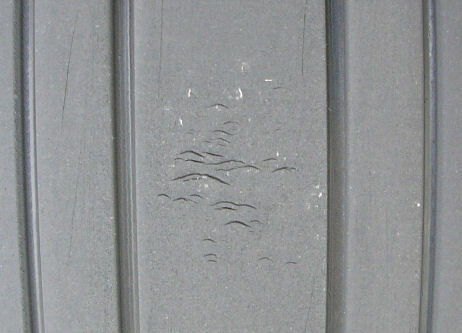 2) Blisters, bulges, or other signs of ply separation in the tread or the sidewall area. 3) Tires with a flat spot which shows the tread reinforcements/cut protector. 4) Other types of damage which can cause tire problems. 1) Measure the tread depth at three points that are equally apart in the tire groove. 2) If the average tread depth on any groove is 1/32 inch (0.79 mm) or less, the tire is not serviceable and must be replaced. 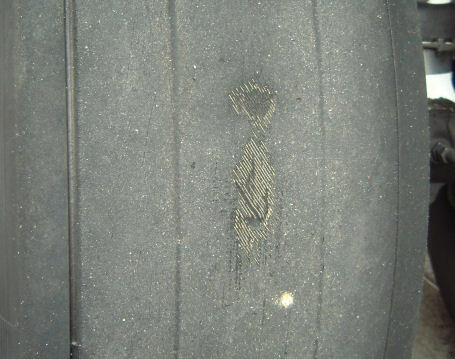 3) If the tread belt ply (fabric) shows at any location, the tire is not serviceable and must be replaced. 4) If the tread reinforcement/cut protector (steel) shows at any location, the tire is not serviceable and must be replaced. NOTE: If the tread reinforcement/cut protector (steel) shows, the tire may be used without safety concerns, but if the tire is left in service you may not be able to re-tread the tire. In simple terms: Tires should be removed when tread has worn to the bottom of any groove at any spot. Tires have varying numbers of plies, and on some tires, wearing through any layers leaves too small of a safety margin. Wearing to the bottom of the groove is the best compromise point between safety and obtaining the most landings. From the Goodyear website: "Chevron cuts occur frequently on higher pressure tires operating on runways with cross-cut grooves. 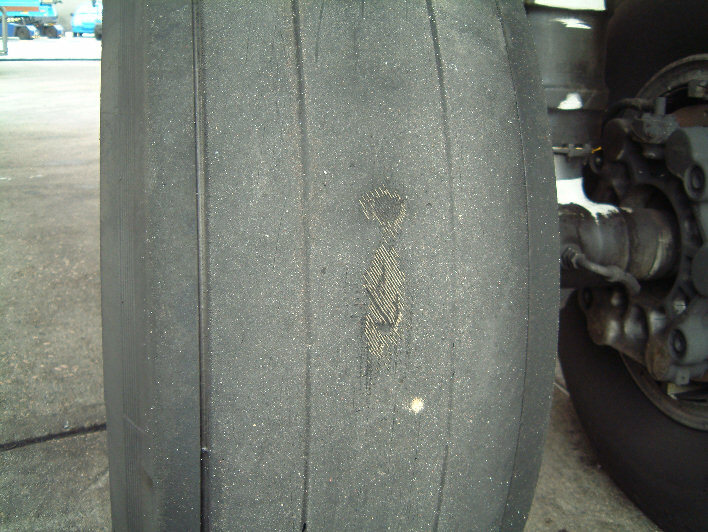 They happen primarily when the tread is still deep and will often wear off and disappear before the tire is fully worn. Despite their unattractive appearance, they are not cause for removal unless they cause tread chunking down to the fabric." Tires with chevron cuts in the tread are not serviceable if any of the single cut limits are exceeded or chunking occurs which exposes the fabric.